The all teak cockpit features an area that can be easily configured thanks to modular cube-shaped seats and also houses an extending dining table and large wet bar, including an induction hob and sink. A full beam locker is located under the cockpit: it hauses the seafty equipment and can be used for stowage. The 180 litre ice box is housed under the captain’s seat and has a highly functional system of racks. extension slide out and in less than thirty seconds it increase the usable space by 40% to create a 25 square metre terrace that can be used as a lounge, sitting room, sun deck with built-in deck chairs, or diving platform. You can command the platform and other functions from your iPhone, just the touch of a button enhances comfort and space by increasing the beam to a maximum of 6.3 metres which is usually only found on much bigger boats. Technology and elegance, quality and innovation, functionality and beauty. 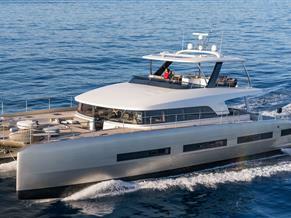 Evo 43 is a new way of living the sea. The Evo 43 is a fast day cruiser with lines that are muscular yet sleek and minimalist and represent form & function at its very best (also available as Open version). Is a key service point for the global shipping industry, a major cruise destination and important centre for ship registration and finance. •	Whilst we offer alternative ports for yacht registration, Gibraltar’s unique status as a full member of the European Union via its constituonal status with the UK makes it an ideal choice for most of our clients and allows a VAT free registration. •	Every yacht witch is used in international water must be registered with a completent Port Authority to ensure its good standing and proper management of ownership details. Malta operates as advantageous leasing option whereby, if a lessee opts to purchase a craft at the end of the lease, due to the resultant decrease in value over the lease period, VAT can be at a significantly reduced rate. We have a number of years experience in the provision of marine services, including: yacht registration, administration, offshore corporate ownership structure, tax and legal advice. Save on VAT! Arrangements and registrations we will handle for you as to your wishes. The design of the Evo 43 is sleek and minimalist with cleats, anchor, fenderhooks which fold away in the deck to leave the lines completely clean. The hydraulically operated anchor locker features a lifting nose which prevents the anchor from being accidentally wound in or out. The anchor and roller are made from polished stainless steel. The cleats and fenders fold away to leave the lines completely clean and enhance onboard safety. In its entirety, the design deems to follow the dictates and style codes of the “minimalism”, but, on closer examination a clear Italian identity stands out, especially in the attention paid to detail and in the choice of precious materials such as glass, solid teak, Plexiglass, leather and choice fabrics. Great attention was paid to liveability and to the use of space above and below deck during a preliminary ergonomic study. Evo 43 can seat up to 12 people on board and has 4 beds in 2 separate cabins plus a bathroom with shower to ceiling, allowing unforgettable day trips, but also short cruises in comfort. Evo Yachts ist eine Marke im Jahr 2015 geboren und ist das Ergebnis der langjährigen Erfahrung seiner Designer, die im Bereich des Segelsports seit 2008 mit Leidenschaft arbeiten, mit Geschick und der Fähigkeit eine neue Linie von Yachten zu erstellen, ein Produkt aus unterschiedlichen Erfahrungen und in hochwertiger, perfekter Qualität aus italienischer Fertigung. Das Design der Evo 43 'ist schlicht und minimalistisch mit Stollen, Anker, fenderhooks, die in dem Deck wegklappen und die Linien völlig sauber zu verlassen. Der hydraulisch betätigte Ankerkasten verfügt über eine Hebenase, die den Anker verbirgt. Der Anker und Walze sind aus poliertem Edelstahl. Alle Evo Yachten kombinieren traditionellen Stil mit innovativen Technologien und innovativem Design und Form die den Yachten eine außergewöhnliche große Eleganz verleihen. Durch moderne Linien und Funktionalität und das alles ohne auf Komfort und Sicherheit zu verzichten. Evo Yachten, die die Serie mit der 43 Evo als Daycruiser startet, setzt auf neue Ideen und neue Projekte mit Engagement und einem Fokus auf das wesentliche und machen somit die Yacht einzigartig.